On a chilly day, most folks find it tough to open the front door to retrieve the newspaper — much less climb a 15,000-foot mountain. But plenty of people court danger by rappelling down canyons and camping in remote woodlands. This week, I tested a device that will give thrill seekers a little extra insurance: It lets the folks back home track their progress, and learn when they’re OK or when they’re in trouble. I tested SPOT in my Washington, D.C., neighborhood (city parks still count as outdoorsy) and on a trip across the California desert and mountains on the way to a conference — though I was scaling mountains in an air-conditioned SUV rather than in a rock-climbing harness. In my tests, SPOT worked without a problem. Notifications from the device were delivered to my friends via email and text message and included my current latitude and longitude. The service also sent along canned messages that I set up in advance on the company’s Web site at www.findmespot.com and hyperlinks to Google Maps that showed my location. SPOT charges a $100 annual service fee, which includes an unlimited number of messages that can be sent out from your device using three buttons: OK/Check, Help and 911. An additional $50 per year tracking service called SPOTcasting follows and marks your exact location every 10 minutes for 24 hours each time it’s initiated. This simple and straightforward device could really help in a dangerous situation. And the company takes its job seriously: A steely message on the SPOT packaging reads, “Opening this box is the first step in making sure you don’t come home in one.” But SPOT could also save the day in less-adventurous situations, such as when your car dies and you’re out of cellphone range. However, SPOT isn’t perfect. While its three message-sending buttons make it easy to use, they also limit the types of messages it can send. There’s no keyboard, so messages must be brief and set up in advance on the Web site. And the device only sends messages and can’t receive them. Your friends and family have no way of getting back in touch with you on SPOT should you send a Help message from beyond cellphone range. SPOT is a bright orange device with roughly the same surface measurement as a BlackBerry, though it’s considerably thicker. Its durable casing makes it waterproof and floatable, along with working in extremes like -40 degrees Fahrenheit and up to 21,000 feet above sea level. It runs on two AA lithium batteries, which last for different amounts of time according to the type of message being sent. Setting up SPOT took only a few minutes on the Web site. A default or personalized message can be set up to go out with OK/Check and Help notifications, and email addresses and cellphone numbers (for SMS text messages) can be entered online as the destinations for these messages. Every message includes the user’s current location in terms of latitude and longitude, along with a hyperlink to access that location via Google Maps. 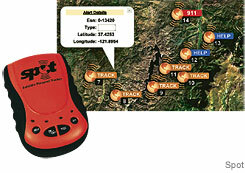 SPOT sends messages and location information via satellite, including points that can be tracked on a map. The OK/Check button can be used most casually by owners of this gadget, as it merely serves to assure others that you’re fine. A good example might be two people on a three-month sailing trip who use this button as a means of checking in with family every Sunday night. If OK/Check is held down for five seconds, it initiates the SPOTcasting tracking service (provided you’ve signed up for it) and locates your device every 10 minutes for a 24-hour period. These tracked points show up on SPOT’s Web site and are displayed as numbered points on Google Maps. SPOT worked for me while driving through a regional park with a campsite, where cellphone range was faint, and up into boulder-crusted mountains. Just minutes after pressing Help or OK/Check or initiating tracking, friends received word of my location via emails and text messages. You can’t set SPOT to track a trip for longer than 24 hours or at different intervals, such as every hour for a week. And the only way for others to view your tracked points is if they sign in using your online account’s username and password. The Help button is used in more urgent situations and uses messages such as “Urgent help needed. Pick me up at campsite.” (The default for Help is “This is a HELP message. Please send for help ASAP.”) But preset messages shouldn’t be made too specific during the online setup because they can’t be changed from the device later. The 911 and Help automatic notifications will always override less urgent messages like OK/Check or SPOTcasting. In the case of the 911 and Help buttons, one can be pressed after the other and the messages for both will still go out at the same time. The 911 button will send a message every five minutes until power runs out (the company says this will last for up to seven days) or until the message is canceled; Help sends a message every five minutes for an hour or until canceled. The 911 button is more serious. When pressed, SPOT Inc. automatically notifies a certified 911 company called the GEOS International Emergency Response Center, which contacts your specified emergency contacts first to see if they know anything about your situation before dispatching a rescue squad using your coordinates. If you can adjust to SPOT’s three-button approach, the device could be helpful for you or someone you know during outdoor adventures. Many people will buy SPOT simply for its 911 button, as an insurance policy on fluky cellphone service. 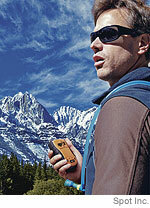 The SPOT Satellite Messenger uses a global positioning system to determine a user’s location and a second satellite network to send notifications to friends, family and emergency services. This column erroneously stated that GPS satellites send notifications.